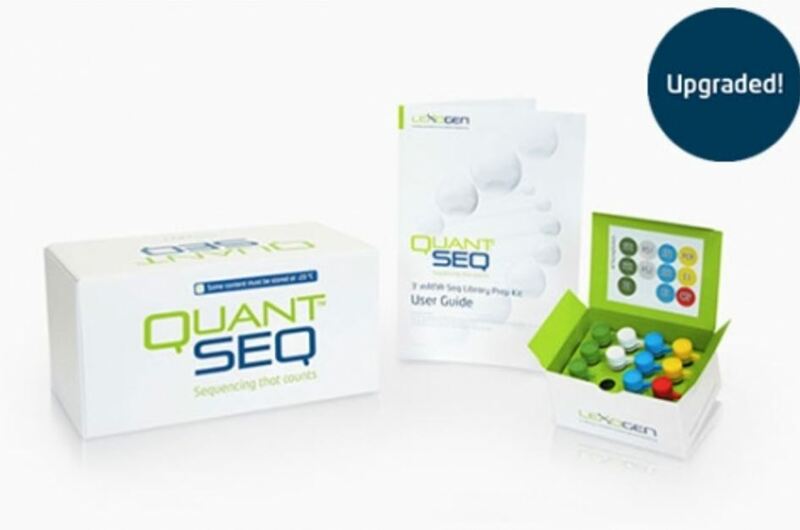 The QuantSeq FWD Kit is an all-in-one library preparation protocol designed to generate Illumina compatible libraries of sequences close to the 3’ end of polyadenylated RNA. The kit is ideal for gene expression counting as NGS reads are generated towards the poly(A) tail. To get the exact 3’ transcript end longer reads are necessary. For multiplexing of up to 384 samples/lane, the i5 Dual Indexing Add-on Kit for QuantSeq/SENSE (Cat. No. 047) can be used that allows the dual indexing with four additional i5 indices. It is already an integrated part in the QuantSeq 3’mRNA-Seq FWD HT Kit for 384 preps. NOTE: The QuantSeq protocol has been upgraded on 17.02.2017 and is now even more streamlined. The RS2 addition step is removed and the following steps (second strand synthesis and purifications) are adjusted. Barcodes have been renamed (i7 Index Plate (7001-7096), formerly Barcode Plate (BC01-96)) and rearranged for a better nucleotide balance for sequencing when only few samples are multiplexed. Moreover, all indices are now different from Illumina barcodes (former BC05 – TAATCG) has been removed. An evaluation tool to check the color balance of index subsets is available here.